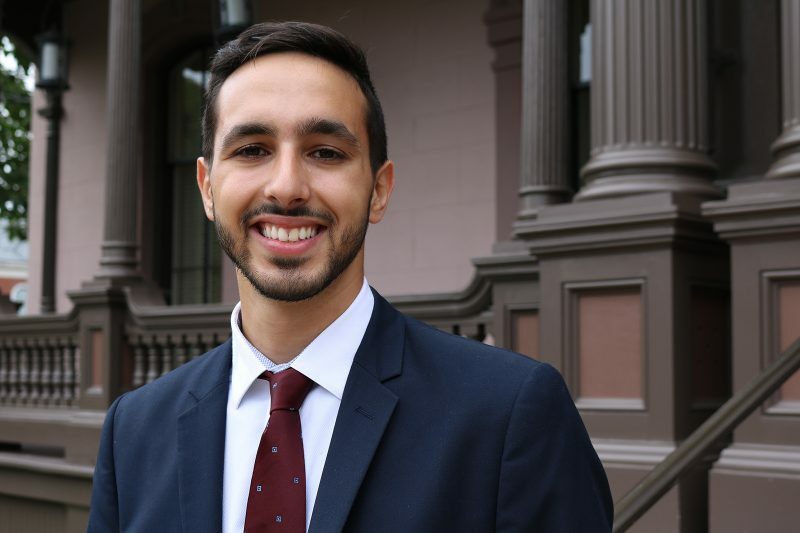 Rayan Semery-Palumbo, a senior global affairs major and a Kerry Fellow, has been awarded a Rhodes Scholarship, one of three recipients from Yale this year. Following graduation, Semery-Palumbo will head to Oxford University as a Rhodes Scholar representing the United States. Rhodes Scholarships provide all expenses for study in England. They were created in 1902 by the will of Cecil Rhodes, and are “the oldest and best-known award for international study, and arguably the most famous academic award available to American college graduates,” according to Elliot F. Gerson, American secretary of the Rhodes Trust. This year more than 2,500 students sought their institution’s endorsement; 880 were endorsed by 281 different colleges and universities, and 32 were named as U.S. Rhodes Scholars. Candidates are chosen for their academic excellence, personal energy, ambition for impact, and ability to work with others to achieve their goals, as well as their commitment to becoming a force for good in the world. “In short, we seek outstanding young men and women of intellect, character, leadership, and commitment to service,” said Gerson. In the arena of public service, Semery-Palumbo has held internships at The World Bank, the American Civil Liberties Union, and Human Rights Watch. On campus, he founded the Yale College First-Generation, Low-Income Ambassador Program. Semery-Palumbo and his family immigrated from Saudi Arabia in early 2001 and endured profound economic instability and homelessness during his childhood; despite these hardships, he excelled academically and graduated from a 4,000-person public school before arriving at Yale with a desire to understand how government can best address poverty and social exclusion for its most vulnerable communities. At Oxford, he will pursue an M.Phil. in international relations.